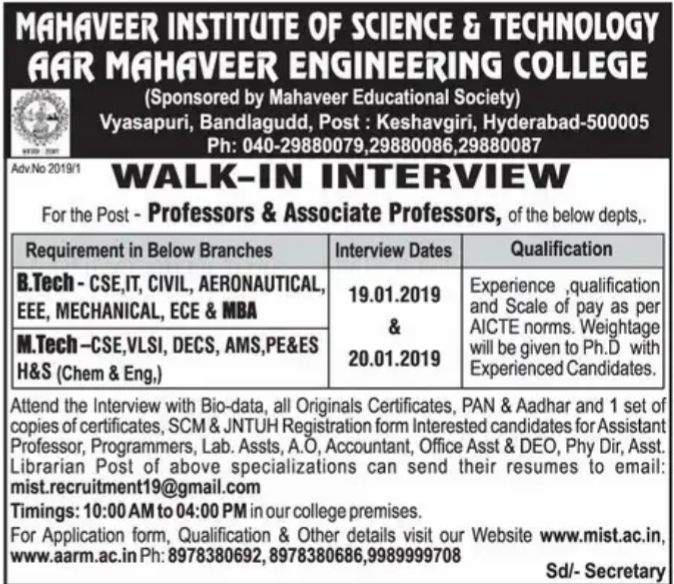 Mahaveer Institute of Science&Technology ARR Mahaveer Engineering College,Hyderabad has advertised for the recruitment of Teaching Faculty- Professor,Associate Professor jobs vacancies. Interested and eligible job aspirants are requested to walk-in held on 19/01/2019 and 20/01/2019.Check out further more details below. Name of the College: Mahaveer Institute of Science & Technology ARR Mahaveer Engineering College, Hyderabad. About College: As an Institute committed to quality education, MIST aims at providing learning with a technology-edge. It endeavors to provide consistent training to its students to help them evolve as competent professionals in the highly competitive world. Right from its inception in 2001, it has been tuning itself to meet this objective. A new civilization is emerging in our lives. This new civilization brings with it a new way of working. Millions are already tuning their lives to the rhythms of tomorrow. The technological revolution and the forces of globalization are changing the very functioning of the organizations significantly in recent years. Weightage will be given Ph.D with experienced candidates. How to Apply: Interested and eligible candidates attend the interview with Bio-Data,all original certificates,PAN and aadhar 1 set of copies of certificates, SCM & JNTUH Registration form Interested candidates can send their resume to email.